Solo is a packed book that I have had on my ‘to review’ pile for some time, so I’ll apologise first of all to Paul Elliott (author of Solo) for not being able to publish this review sooner. Because Solo is such a useful product, I wanted to make sure that I wrote a review that did it justice, so I’m splitting it into two parts. This first part will cover the sections ‘Characters’, ‘The Plan’ and ‘Storylines’. The second part will look at ‘Random Rolls’ and the different types of campaign. One of the ‘problems’ of the RPG gaming hobby is sometimes you simply don’t have any players to game with. This is especially true of old school gamers like me where real life, work, family make significant demands on our time and it can be difficult to set up a gaming session. For those in-between times where other players aren’t available, there is the solo gaming option. Different systems have provided solutions to this approach, Tunnels and Trolls is probably the most famous for its series of solo dungeons. Classic Traveller didn’t offer any similar ‘structured’ solo adventures in the same style as TnT, though there is DA4: Marooned Alone as the closest alternative (click the link to see how I got on with this a few weeks ago). CT does offer however many ‘in game’ ways to play solo, such as the whole character generation process and trading and I recall using AD&D some years ago which offers the random dungeon generator in the Dungeon Masters Guide (1st edition). If your preference is to use one of the latest Traveller / SF 2D6 RPG systems, what are your options? Mongoose has some Traveller Solo adventures for Mongoose Traveller 2nd edition, but I can’t comment on these as I’ve never seen the book contents. 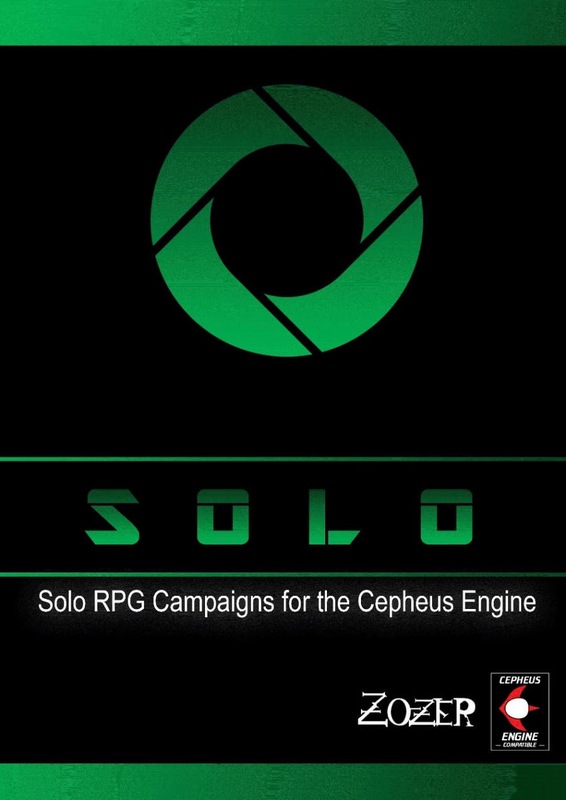 For the Cepheus Engine rules set, Solo aims to provide a solution. One of the most enjoyable aspects of gaming is to create characters and their background. Because Traveller / 2D6 SFRPG adventures tend to be more ‘group’ orientated (ie. you need many characters) Solo advises that you roll up a number of characters with which to play. As there are a number of things that can happen especially if you are commanding a starship for example, you stand more chance of advancing through a situation if you have many characters ‘at your disposal’. However, rather than simply rolling up a series of character stats, Solo encourages you to think of the relationships between your group and introduce how they react to each other. There is a really nice table in D66 format which lists some of the potential relationships that the party have had with each other, here are some examples:- ‘Bickers’, ‘Competitive Rival’, ‘Knows a Dark Secret’ and ‘Divorced Over Differences’. This all helps to build backgrounds for the party (and makes for some interesting ongoing situations onboard a starship!) Solo has some tools (such as the ‘Reaction Table’) with which to make best use of these relationships and other tools to add contacts, enemies and other NPCs. This assists you with the next section, ‘The Plan’. 1. Trying to cover every single potential situation that could occur. 2. Trying to ‘randomise’ situations. 3. Attempting to make the situation ‘flow’ in a story-telling manner, so that it simply doesn’t feel like a series of dice rolls. 4. Not falling into the temptation of dismissing an unfavourable dice roll result and rolling again until you get the result you want, simply because its easier to deal with, or advantageous. Solo addresses this by getting you to ‘take a step back’ and not necessarily worrying about having to try and cover every single potential solution, or to try and roll for it. Instead it tries to get you to think about the storytelling side of the situation and the flow of the adventure. This takes some preparation and a bit of getting used to, but the ultimate aim is to try and create more memorable adventures; its more satisfying to recall that you managed to fool the broker into accepting those dodgy credits and escape the cantina rather than thinking ‘My Bribery-1 skill helped me get an 8 and then roll a 10 to escape the cantina’. Thats the aim of the approach anyway. Rather than trying to setup a complicated system with loads of dice, Solo has a nice resolution system where you simply roll a die based on the difficulty of the plan (which you have to decide on), which can then be resolved on one table as to what the consequence is. Its a neat system; you have to be honest with yourself and to a certain degree be disciplined in keeping to the roll result. However, because Solo encourages you to ‘storyline’ your adventure, this gives you the scope to elaborate and expand on the situation, which leads into developing the adventure further. Storylines are the heart of any adventure, but you need some tools with which to set up the initial details. It can be very difficult to think of everything from scratch, without some sort inspiration or structure and frankly off-putting. Solo gives you advice how to best create a storyline, without getting too hung up on the details. What I do particularly like about this book is that there are plenty of examples; though it is based on Cepheus Engine, it supplements it by simplifying some aspects and tailors it for solo play. To demonstrate what Paul is trying to put over, he’s provided lots of examples of how these processes work. This isn’t just a short paragraph or two, he takes each section and adds to it so as you work through the book, the whole process is demonstrated in great detail. So thats first 36 pages covered; in the next part I’ll take a look at the remaining part of the book – random rolls and types of campaign. **Update 14th Sept** – I’ve now publushed the second part of my review of Solo here. This entry was posted in Cepheus Engine, Classic Traveller, Clement Sector, Mongoose Traveller, Traveller TNE, Tunnels and Trolls and tagged Cepheus Engine, Review, Solo, Supplement, Traveller, Zozer Games. Bookmark the permalink.